Now you can start to see detailing added, though this is *very* far from complete. I needed to enlarge the image to get the intricate detailing built up in layers, and you are starting to see that begin to take shape in the main image here. My scanner isn’t big enough to accommodate the entire picture now (which is currently around 10.5” x 16” in size vs the original 9” x 12”), which has been laser copied onto heavy cardstock. Already, the limitations of the new substrate & laser copy versus the original substrate have presented my first challenges from a mixed media standpoint in developing the image. The first journal (“Turn On the Light”), I would get a little freaked out when I looked at the state of each stage as I was doing it, seeing changes come into it that felt out of control, and moved me seemingly away from the image that was growing in my mind, and I would worry at stages that I had ruined the vision, but watching some of the instructional videos that you can find online or instructional articles by artists, such as Milliande, DJ Pettitt, Mysty Mawn, Pam Carriker, and Willowing, just to name a few (look for them on YouTube & elsewhere) who demonstrate working with layers, and seeing all of the evolutions, devolutions, and gradual building up of layers to arrive at their rich final images, full of depth and character, I would see interim layers that temporarily appeared to me to be digressions from the image they were after, until I saw the importance of those interim layers in the cumulative final image. In the image to the left, for example, at this stage, the face lacks much detail and depth, and appears that the colors are a bit flat and incomplete, and much more harsh than the final image will be, but that’s ok, because it’s still being developed and this will ultimately contribute to the depth and dimension of the final image. This is only 1 stage in the layering process, that will probably ultimately consist of 7 or more layers before it’s finished, and each subsequent layer will have significant changes from the previous image, just as this one does from Stages 1 (a & b). That is all part of this process in multi-media sense. I already am battling small challenges with the media,though I am learning, and don’t get as frustrated as I become more familiar with how they behave with one another. This is the complexity of working with mixed media, it’s like taking a whole lot of different prescriptions meds: you not only have to be concerned with how a particular medication might act in your system, but how it interacts with everything else in your system, as well. Same for mixed media, and depending on your depth of understanding all of the various media & substrates, etc., and the changes in those elements over time, this can prove to be an endless learning process. I now had comparatively limited tooth for what I would have preferred to do with only graphite and colored pencils at this point, with some watercolor washes before moving over heavily into acrylic (which has been problematic to work with dry media later), so I try to get that bit down first before beginning to build up layers of acrylic. However, this didn’t work so well on this slick sealed laser printed surface. Even graphite didn’t adhere well to this surface, but softer graphite, like a B/HB was at least sufficient for me to get the scales drawn out which I then burnished in with yellow Prismacolor pencil (cadmium yellow), and I “washed” some scarlet red watercolor pencil over that, which settled down rather nicely into the grooves created by the burnishing of the gold. I do like the 3D effect that the burnishing had on working with this new substrate. I had them do the copy onto the heaviest cardstock that they had in this size, which is somewhere between poster board and matte board in weight and consistency, so burnishing left definite physical grooves in the substrate to good effect. Although the laser print is at least not a glossy finish, the matte finish afforded me little improvement in applying dry media, but no matter. I’ll make it work eventually. I just want to be able to build up at least some thin transparent layers to give it depth and enhance a feeling that it is all floating within a watery environment, and to give it more dimension, and therefore portions of details of the image I am trying to get down on this first level. Ultimately, I will use clear acrylic media to restore some tooth (I’m thinking at least one layer of matte medium or clear gesso at some points for tooth, an another of acrylic ground for pastels to bring in washes, and then later some glazes). I will need to do an image transfer to lift this image off this surface, and sandwich it on top of another somewhat transparent layer of acrylic medium, probably one of the gel mediums, and adhere that to the permanent substrate, which I’m thinking will be a heavy watercolor paper. I know I should probably go with canvas, but I resist because I still like to carry these in a big book to protect them and enjoy them at my leisure. I used a white galaxy marker to bring some semi-opaque white over some areas to expand the gessoed portions of the 2nd layer (mermaid) juxtaposed on top of the background scene. What I like about the Galaxy marker is both the opaqueness, and that it lacks the gloss, thickness and resistance that the other opaque marker options would have left, like the Deco Paint Markers or gel pens. As I think about this, I guess another option would have been something like Staz-On Ink pad & brush. I used it anywhere that I wanted to be able to bring some opaque white that had the potential to blend with either the laser inks subtly, as well as whatever I wanted to add next, prior to shifting over to mostly acrylic. You can see this in the softening of the blue skin tones, and building out the fins, and I also hit each scale with a little bit of the white marker to add a layer of dimension and further enhance the impression that the scales are more concave and the light hits them more toward the centers where they stand out more, versus the valleys around the scales. There will be some adjustment to this concept in a subsequent stage, as the tips of some scales overlap adjacent scales a bit, which will be developed in subsequent stages as it gets further refined. In the hair strokes, in addition to selective application of Deco Paint marker to lay out some specific whisps of hair, I have also used the Galaxy pen along with water soluble oil pastels to bring in a bit more blue/green into the hair as well. My reservations about using the Deco Paint markers at this stage are that they have Xylon in them which is smelly, but more importantly, can dissolve the inks from the laser printing if I’m not careful, and I didn’t want to obliterate the lovely background that should show through bits of her flowing hair, at least not yet. Lots more detailing and shading to come in subsequent layers on this mermaid, and there will be a story about this image, as well, which I will reserve until I have finished. To try to tell it now, as I see it would be incomplete at best, and possibly not very accurate, because my mind tends not to reveal everything of what this is about even to me, very often, not until some time after I have completed the piece, though by the end, and perhaps after a night or two of reflection on the completed piece, I usually have a mostly complete understanding of what my mind was trying to tell me. This is a really funny thing about this process of art journaling and art therapy, because it opens up a kind of dialogue with your subconscious that gives you more direct access to what’s going on over there, though the way that I am able to achieve this kind of communication is unlike what happens on a conscious level or in a physical conversation with another person. The hardest part for me, who has relied heavily on left brain working independently to tell me what I am thinking and feeling, is developing a process that is really about letting go of controlling my mind, and letting the other part of my brain drive the bus, and wait for it to reveal itself to me through this process. But as new and unfamiliar as this was at first, regularly practicing it has shown me that it works, and I am growing my skill at increasing left-right brain integration, which is taking my mental capabilities far beyond what they were, not to mention pulling the pieces of me together, which I really need right now to deal with my challenges. What I will tell you at this point about the story is that when I started it, as is often the case, an image began to form in my mind, or, I should say, portions of an image, each portion out of context, that seemed like whimsical images, that were just fun and relaxing to draw and explore. There are a number of physical imperatives/impediments to art for me that affects how and when I do art. The way I started this piece was really just to help me keep my mind off pain to keep me as calm and relaxed as possible, while my body was riding out a 5-day stretch of very nasty flares. For those of you who have given birth to children, my experience is somewhat akin to labor and delivery, though it happens on a much more regular basis. The art keeps me from getting overwhelmed with the waves of pain and gut upheavals that come with the flares, since there is no medication to manage the pain or spasms that is safe for me to take, so I have only what I can do with my mental state (biofeedback and constant attitude adjustments), and physical manipulations (massage, gentle walks, hot Epsom salt baths, having a good cry in my husband’s lap when I reach the end of my rope with it sometimes), and doing art is more effective in shifting me away from focus on suffering and discomfort without draining my energy, such as when I try to do something involving verbalizations & critical thinking. Only my left hand and arm were really available to me during this recent round of flares, and then only in a limited sense, and there have been painful consequences of using even my arm and hand, though these are minor by comparison. Between these drawing sessions, which I try to gentle down as much as possible (keeping my hand and arm loose, well supported, and being careful not to create repetitive injury issues), I try not to work in any particular physical position for too long at time. I still get the spasms up and down my arm, and the Reynaud’s comes and goes (causing numbness and pain especially in my fingers), but at least, so long as I don’t try to do any serious gripping, twisting, pressing or pulling, the swelling in my joints doesn’t get too bad from the exercise. If the spasms get too bad, I do have to stop, get some heat and gentle massage to the area, change positions, and rest it. The most I can do when that is happening is to shift to drawing doodles, on little bits of paper, here and there. Good ergonomics, both with the drawings and working on my laptop minimize the carpel tunnel symptoms that the RA & Reynaud’s cause, though sometimes I am in the “flow”, and don’t notice that I’m breaking this rule until I notice that I can’t feel my fingers while I am working sufficiently to get my attention. I keep unruled paper and pencils & a drawing pen at my bedside table, as well as by my recliner, just to doodle things of not apparent import. 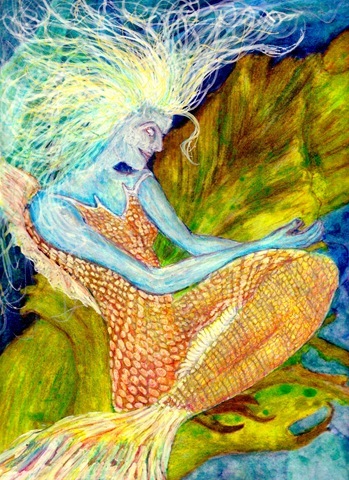 Ok, back to this image: the mermaid is reclining on some giant seaweed, and you will see that she is focusing on something special when I bring the next major element into the picture. The seaweed and the the rest of the surrounding context still have lots of work yet, as well as the effects of the underwater atmosphere, and I will develop those more before I introduce the new element. More to follow, of course, but today, I’ve got husband available to help me do some heavy lifting and hopefully get some of the household restored to order so we can at least move around, so if I work on this more today, it will probably be later in the day. However, I do have a couple of other tidbits that I did that I think will be fun and attractive, both rather serendipitous and have given me ideas for new pieces, and I’ll throw them up on a separate blog post.